Andrew “Andy” Richard Olson was born to Olaf and Lillie (Hunsicker) Olson on February 15, 1928 in Swea City, IA. When he was three, he and his family moved to their family farm near Willmar where he continued to live for 86 years. Growing up on the farm he helped with many of the chores. During this time Andy attended country school until the eighth grade. Following his schooling, he continued to help on the family farm until he enlisted in the US Navy towards the end of WWII. On April 8, 1948, Andy was united in marriage to June Berglund in Willmar. He would serve again during the Korean War. After the war, Andy returned home, continued to work on the farm, and also opened his own company, Olson Trucking. Andy was active in the American Legion as a Chaplain and also at the Refuge Church as an usher. He enjoyed hunting, fishing, gardening and spending as much time as he could with his family. Andy was a loving husband, dad, grandpa and friend. Andy is survived by his wife, June, children: Mary Lou (Claire) Kvaal of Willmar, Richard Lee (Kathy) Olson of Willmar, Barbara (Marvin) Sandvig of Sunburg, and Cindy (Bruce) Bakken of Sunburg; grandchildren: Ronald Clancy Jr., Kari Steele, Stacey Olson, Shawn Olson, Chad Sandvig, Rodney Olson, Mindi Anderson, Kelly Sweere, Cody Bakken, and Dylan Bakken; great-grandchildren: Andrew, Courtney, Payton, Austin, Andrea, Aaron, Arica, Megan, Kali, Levi, Abby, Logan, Shakira, Wyatt, Clayton, Lexi, Jackson, Weston, Samantha, and Theo; and great-great-granddaughter, Alice June and many nieces and nephews. 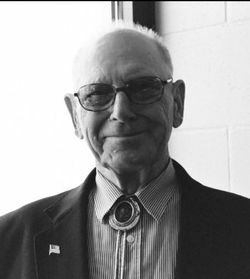 He was preceded in death by his parents, siblings: Charlie Stone, Evona Lush, Juanita Seffens, Raymond Olson, and Wayne Olson; granddaughter, Shannon Sandvig; and nephews: Jerry Seffens, Stan Lush and Randy Olson.